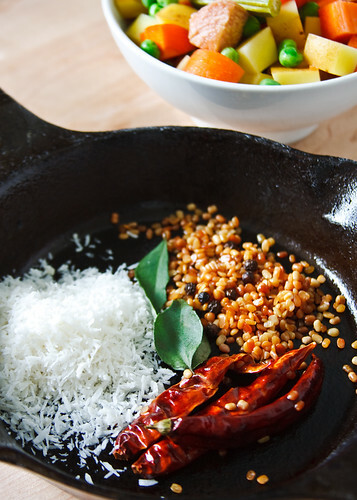 Varuthu – roasted, araitha – ground, kootu – medley. That’s all. 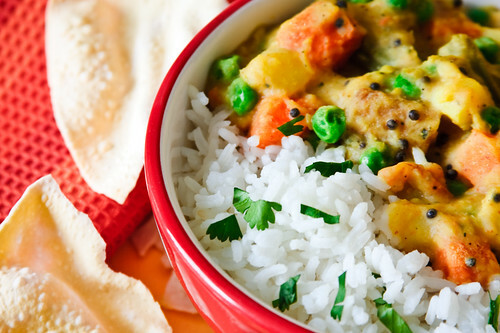 Freshly ground spices with cooked dal and vegetables – healthy one pot meal. Poricha kootu and varuthu araitha kootu are stand-ins for the traditional sambar. They are usually made without tamarind. But what the kootu lacks in tang, is made up by the freshly roasted spices. 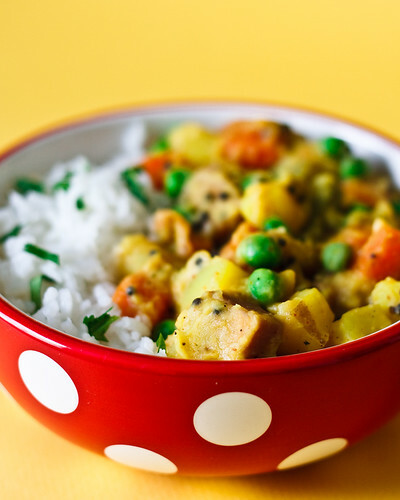 My mom usually made this kootu with odd vegetables lying in the crisper. I used to be puzzled why this kootu was followed by my Appa’s visit to the market :). In the later days, my mom prepared it, even if the fridge was brimming with produce. She used to happily oblige with a tenderly request, knowing how much I loved it. Cook moong dal until soft. Cook vegetables in water with salt and turmeric until soft. While the vegetables are cooking, heat a tsp of oil and roast red chillies, black pepper and urad dal until golden. Let cool and grind along with coconut, asafoetida and curry leaves to a smooth paste. When the vegetables are cooked through, add cooked dal, the ground spice mixture and salt and let it simmer for 5 minutes. Finish off by adding spluttered mustard seeds in the remaining oil. Serve hot with rice and gingelly oil or ghee. We enjoyed ours with urad dal appalam(South Indian savoury wafer). This is my entry to No Croutons Required: Indian Soup or Salad, co-hosted by Lisa and Holler. love the bowl, love the pics! i make this spice mixture for pretty much any vegetable but never done it with a medley! Hi, this is my first visit to your blog. i must say...i'm already loving it.Kootu i thought was made with toor daal but usage of moong daal looks great. I love your araichuvitta sambhar..and now, this kootu is also going to be my favourite. It looks delicious! Nice preparation. I love anything with varuthu rachithu. ANd this curry looks so yummy . daal looks very delicious Suganya. Lovely click. Kootu looks delicious. My tamil friend used to make similar kootu with frozen mixed veggies & moong dal. Great entry. Comforting Kootu, Amma made similar kootu for Thiruvadhirai.... Ammas food is always great tasting. I am going to make this today.. well something similar. Thanks suganya, for i had been hammering my brain since morning & couldn't think of something new with veggies.. I already did the "T&T", or else I would have posted this:-) ur recipes are simply superb. Suganya, I made this just now. Simple, easy & delicious. However I boiled the mung dal & the veggies together, which left a little crunch to the dal & i like it. Thanks! loved the polka dotted bowl!! varathu araitha kootu is always my favourite accompaniment to sambar! Will surely try this ! hey this looks so lovely.i must try this. can you cook for me?? Just the type of meal I enjoy. Lovely! Thanks so much for your entry. one of your rare white rice occasions?? love the pic with the spices. i tried making quinoa your way in the pressure cooker. it rocks. I love araitha kootu and kozhambu - something so refreshing about the fresh ground spices! Oh this looks so good!! Wow, this looks really good! sounds good. will try it sometime soon.